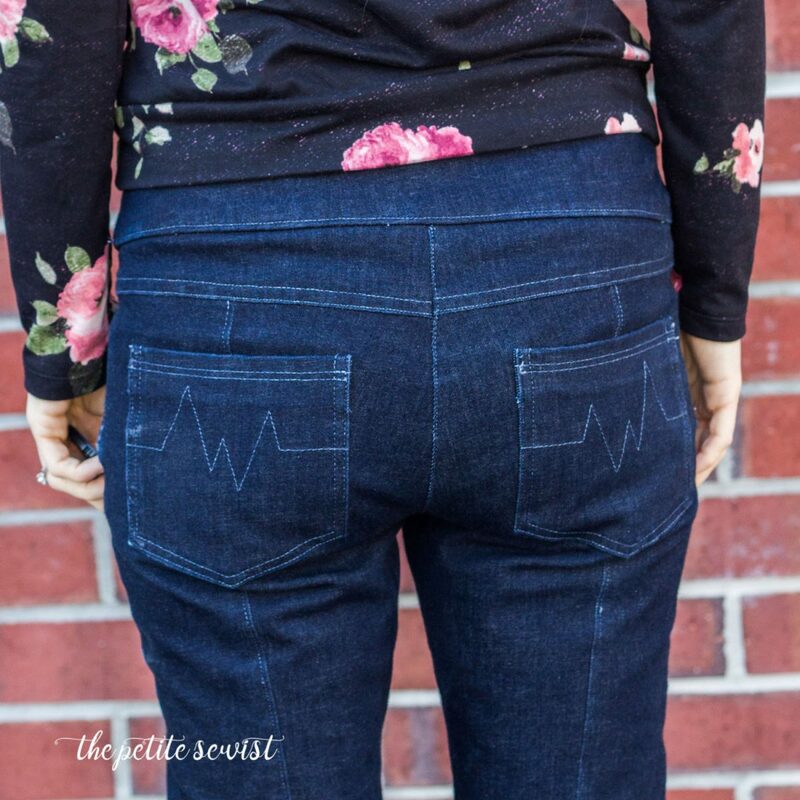 The Mountain View Pull-On Jeans by Itch to Stitch Patterns is a stretch jeans pattern featuring a yoke and elastic waistband. 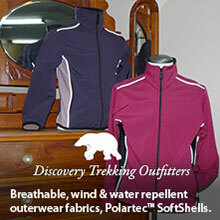 It has a unique center back seam that is great for making back leg and seat alterations. Don’t have time for a zipper? This pattern features a faux fly. That makes the construction of this garment a snap! My muslin for this pattern was a pair of white twill shorts. They were a little bigger than intended, but (happily) I have gained about 5 lbs. since then, so I cut out the same size this time. Really the only changes I made between my muslin and this pair of jeans was to lower the seat a bit more and to slim the legs below the crotch at the inner and outer side seams and the center back seam. 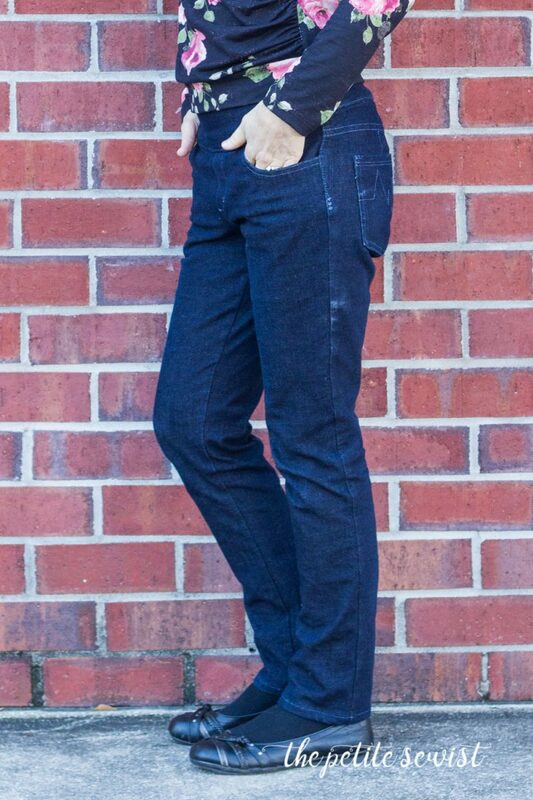 The fabric is a 25-30% stretch denim from Discount Fabrics in San Francisco, CA. I was very excited to find this fabric for $9/yd last winter. It was a bit of a let down to realize the fabric was only 45″ wide. Thank goodness I’m short and still had enough fabric for this project! I had to take in the side seams and the back center seam quite a bit to get a good fit in the legs. It was difficult for me to tell how wide the pant leg should be because MY WHOLE LIFE my pants have been baggy in the legs. I learned that the proper width can be affected by the type of shoe you plan to wear. I wanted a slimmer but not quite skinny leg that would pair well with flats and occasionally sneakers. So, how do you know where to hem your pants? If the pant legs are bunching above your shoes, they may be too long. Hem them so they sit smoothly over your shoes. You can pin and check the length before hemming like I did. In this (horrible) bathroom photo you can see that the length on the right is just a bit shorter and solves this problem. This shorter pant length and more fitted calf is a new trend I’m trying to get used to. And hey, if you’re not sure on the width or hem length, you can always start with a conservative adjustment, wear them for a while, and see how you like the fit. I actually went back and slimmed down the leg more and hemmed a bit shorter. Which brings me to my next observation…I seem to have tapered the leg a bit too much in the lower leg. You can see there is a bit of bunching above the knee. There is also a twisting effect in the thighs. I think this is because when I made my muslin, I took more width out of the inner leg than the outer leg, when I should have done it evenly on both sides. I definitely need to go back to my master pattern next time and make some adjustments to avoid the problem in the future. 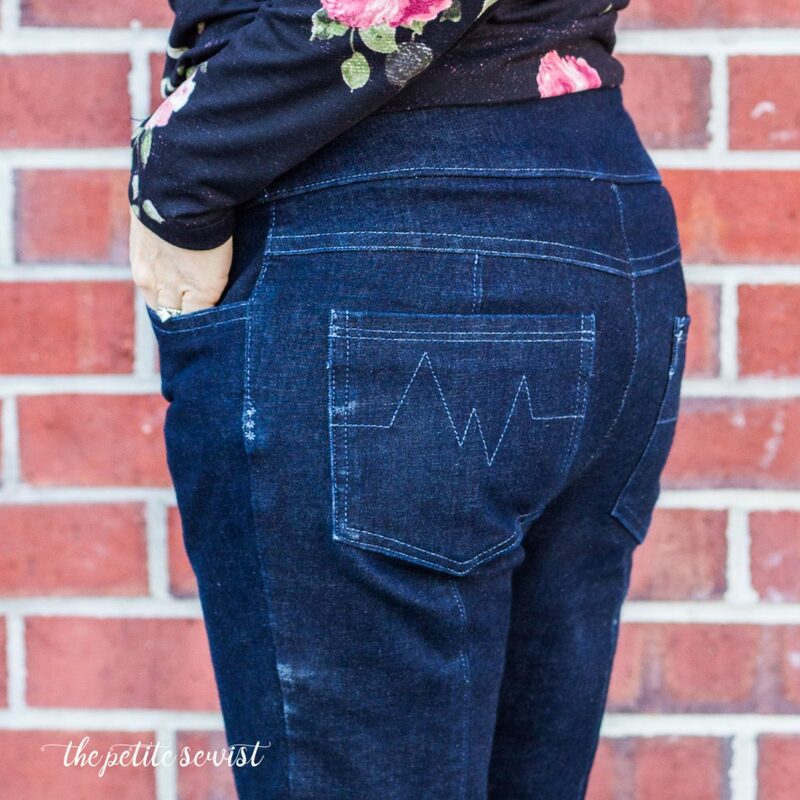 I saw this heartbeat back pocket design from another maker on Instagram and decided to make it my own! I may go back and add rivets to the pockets. Do you think it would be an improvement? This is the fourth pair of pants (including shorts) I have completed this year. Every time I make jeans, it gets easier and I learn more about how to fit my unique body. 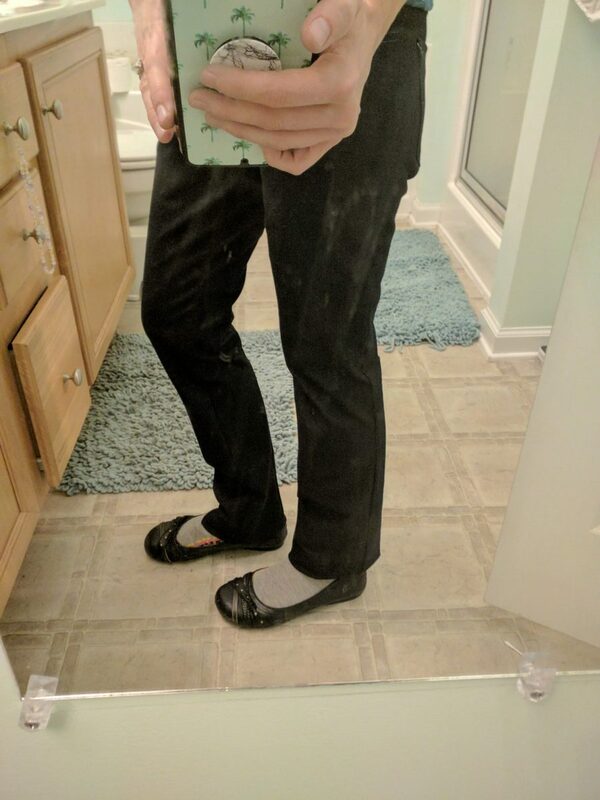 Despite a couple minor fit issues, I am super happy with the fit of these pants. 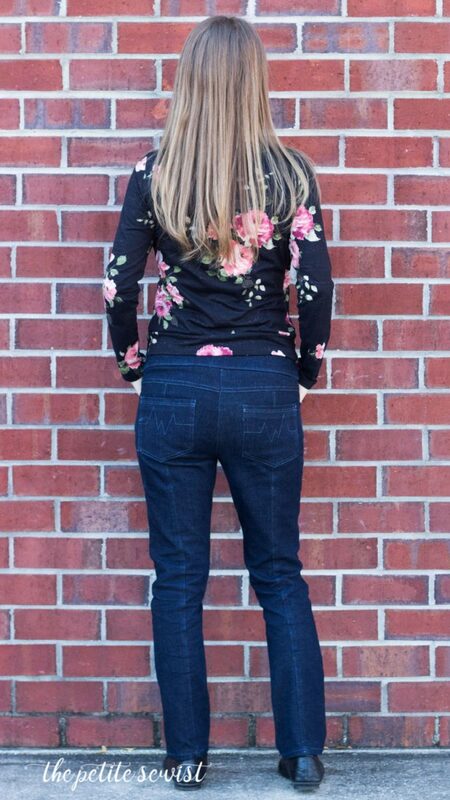 I mean, come on…I’ve never had a pair of pants that didn’t jab me in the crotch AND made my derriere look fab. Seriously, it’s so wonderful to wear a pair of pants that look like jeans without the annoying waistband that is either too big or too small. (I HAATE belts.) I love the elasticized yoke! The Mountain View Pull-On Jeans pants are a dream come true. Thank you for taking the time to read this post! If you’re curious about my other denim projects, you can find them HERE. 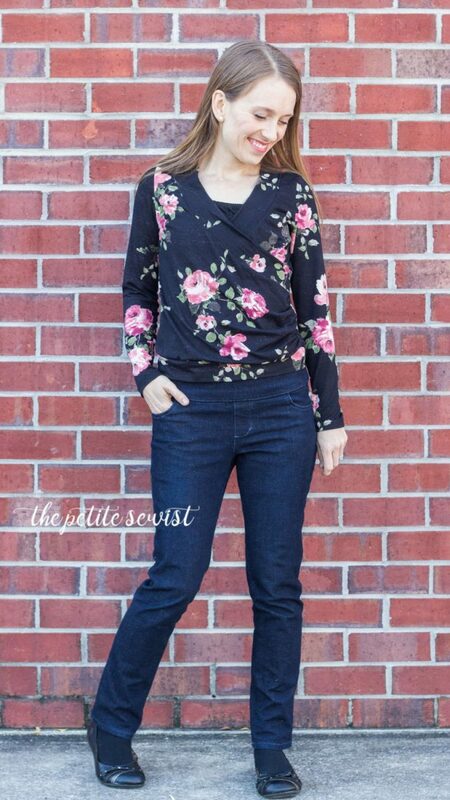 The top I paired with my jeans is the new Medellin Top, also by Itch to Stitch – my review of that pattern is here. Great job! I didn’t think I’d like the CB seam on the legs, but I actually love it looking at this!! That CB seam is sooo cool! What a great pair of jeans! The hem length does look just right. These look fantastic!!!!! I need to sew these.